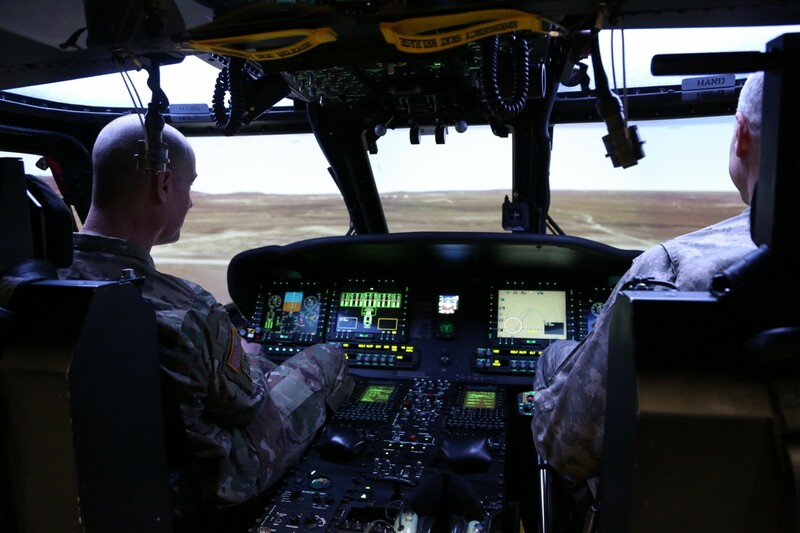 REDSTONE ARSENAL, Ala. -- Three years after the first prototype for the Black Hawk aircrew trainer was set up and implemented as a training aid at Fort Bliss, Texas, that technology has been enhanced. A team from System Simulation, Software and Integration Directorate, U.S. Army Research, Development and Engineering Command Aviation & Missile, also known as AMRDEC, has developed the Collective Aircrew Proficiency Environment. Crew chiefs and gunners can train in a realistic setting where they see and hear the same things simultaneously. Because there was no funding, Joseph P. Creekmore Jr., S3I aviation trainer branch chief and BAT Project director, said BAT team members used borrowed or discarded materials to work on the CAPE during breaks between scheduled projects. "Design began over a year ago at a somewhat frustratingly slow pace for the BAT Team but, week by week and part by part, the CAPE device took shape and became the device we have today," Creekmore said. The singular focus of the Army's modernization strategy is making sure the warfighter and their units are ready to fight, win, and come home safely. As the head of the BAT Project, Creekmore said he believes the Army needs the CAPE to contribute to and ensure readiness in aircrews. "Because we are a nation that has been continuously at war since 9/11, all the BAT Projects' Army aviators have experienced combat overseas," Creekmore said. "They all went into combat as part of a trained team. "They all survived combat because they fought as a team. All the BAT Project's former and retired Army aviators know to their very core that, to fight and win America's wars, the Army must train as it fights and that includes training as a full aircrew," Creekmore explained. 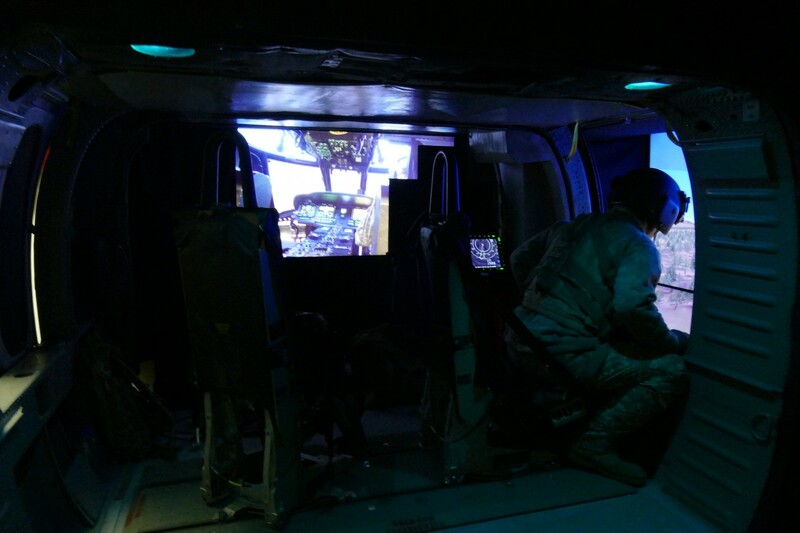 "So, from Day 1, the BAT Project dreamed and planned for an opportunity to demonstrate an excellent whole-crew trainer that would contribute to the readiness of all U.S. Army Air Warriors." CAPE and BAT are linked using an ethernet connection. Creekmore said the nine locations with fielded BAT devices only need a tethered CAPE to provide Army aviation units with a way to train a complete UH-60 aircrew. Manuel Medina, S3I assimilated integration technician, said he was blown away when he was first introduced to this technology. "Back when I was in, we didn't even have anything like this... If we had the flight hours and the maintenance money to train, we would." According to Jarrod Wright, S3I lead integrator who built the BAT, many aircraft incidents are a result of some type of aircrew miscommunication. "What we're trying to do here is ... teach that crew coordination to allow pilots and crew chiefs to train like they would in combat with two devices tethered to each other," said Wright, who spent more than eight years as a crew chief. 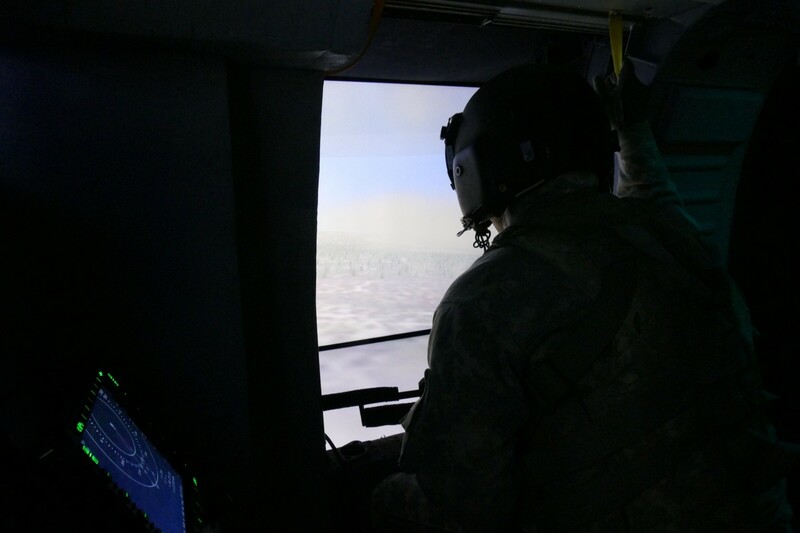 "In combat, no UH-60 breaks ground without its full complement of two rated aviators, a non-rated crew chief/door gunner and a second door gunner," Creekmore explained. He said this type of equipment and training is necessary to maintain the high performance level and proficiency that exists in our Warfighters. "This environment allows you, not only to train, but to evaluate potential crew chiefs and door gunners," Wright posited. "You're not throwing someone in there and saying, 'I hope he gets it'." Medina, also a former gunner and crew chief, said this technology can benefit the Army in many ways. Not only can maintenance costs, flight hours, fuel, and training dollars be reduced, but the BAT and CAPE systems focus on considerations like spatial orientation or disorientation, response to changes in gravity, and susceptibility to airsickness. These devices mimic conditions crews see in flight and can identify adverse reactions while minimizing inherent risks. The BAT Project team has high hopes for the CAPE. "It is my hope that ... the Army invests in further development of the CAPE and then fields it as BAT mission equipment so we can get this critical training capability in the hands of UH-60 aircrews throughout the Army," Creekmore said. Wright said the potential exists to use this technology to train complete crews in rescue hoisting and cargo sling load - any scenario they might encounter in any type of combat or rescue situation. He even sees the possibility for the BAT and CAPE to be used as preparation for hurricane relief or similar missions.